A new movie debuts today called 'OZ, The Great and Powerful' and is a prequel to the popular movie The Wizard of Oz. The story began as a book, The Wonderful Wizard of OZ (1900) by Lyman Frank Baum. L.Frank Baum was born May 15, 1856 in Chittenango NY. He had been a life long lover of theatre and tried unsuccessfully to have a career in theatre. His writings did much better for him, though he did take his story The Wonderful Wizard of OZ and turn it into a theatrical play called The Wizard of OZ. "O.Z.P.I.N.H.E.A.D", he shortened it further to simply OZ. He becomes the ruler of OZ probably because of his magical abilities and his name OZ written across his hot air balloon. During the same period of time, the preeminent magician in the United States was a fellow named Harry Kellar. He had been a world traveling magician, but after the deaths of the English magician Robert Heller and the European magician Herrmann the Great, Kellar had the title all to his own. Heinrich Keller (Harry Kellar) however was born here in America, in Erie PA on July 11, 1849. He was not a circus magician, but he certainly was a traveling magician. He apprenticed under the Fakir of Ava, then went out to manage the famous Davenport Brothers. He left the Davenports and took William Fay with him and they started their own act, traveling through Mexico, South America and beyond. However, on their way to Europe, the ship they were on hit rocks and sunk, taking all the money Kellar and Fay had made on their trip, as well as their costumes and props for their show and leaving them at the bottom of the sea. Bad luck would not plague Kellar forever and he eventually came into his own. 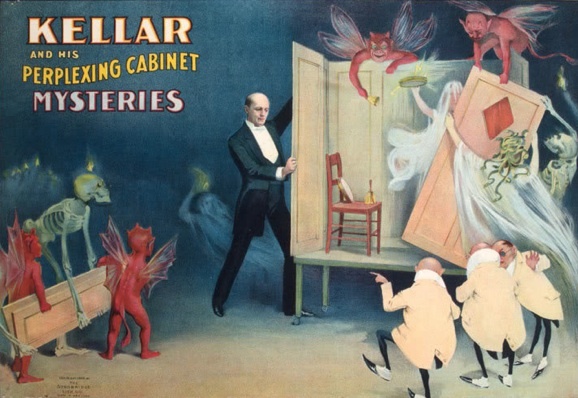 In 1900, the year the Wonderful Wizard of OZ was published, Kellar was the #1 magician in the country. I've heard it said that Kellar was the inspiration for the character of the Wizard of OZ. Mike Caveney, the well known magician and magic historian has said this in interviews. But I checked his book called "KELLARS WONDERS" and I didn't see any reference to it (though it's possible I missed it). 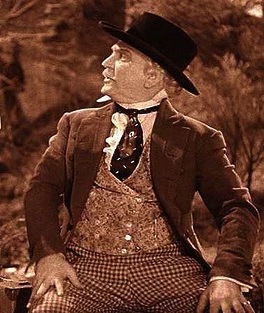 The connection is mentioned in the Gail Jarrow book on Harry Kellar called "Harry Kellar Great American Magician", although she says that readers of the book 'The Wonderful Wizard of OZ' will recognize the wizard as being like Harry Kellar. I recall watching the movie 'The Wizard of OZ' as a kid and remembering fondly the character played by Frank Morgan, the Professor Marvel character and later the Wizard. The movie character always stuck with me and when I later got interested in magic and came upon Harry Kellar, I wondered if Kellar was like the Professor Marvel/Wizard character that I had seen in the movie. But honestly, Frank Morgan while in the character of Professor Marvel in the movie looks more like the magician Dante (and Dante was a very popular magician at the time the movie was made). I am not sure where this idea that Kellar inspired the WIZARD character came from. 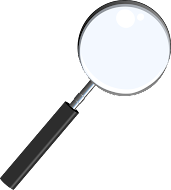 Though I vaguely recall the idea of the connection was attributed to Martin Gardner. I think it's highly likely that Kellar could have been in the inspiration based on the fact that Baum was a huge theatre buff, Kellar was the big name at the time and the illustrations by William Wallace Denslow are a dead ringer for Kellar. If nothing else, perhaps the illustrator Denslow was inspired by Kellar and that is why the pictures look so much like him. I even have a photo somewhere of Kellar wearing a white jacket like the one on the Wizard illustration, but I can't seem to find it right now. I do believe that Kellar figured in there somewhere during the creation of the original book. There is one other thing to consider and that is the word WIZARD. 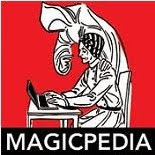 Magicians of that time were calling themselves: magicians, conjurers, manipulators, illusionists, escape artists, professor, and similar names. The word 'Wizard' was more commonly used in the mid 1800 with folks like John Henry Anderson known as The Great Wizard of the North, and John Wyman Jr. known as Wyman the Wizard. In the 20th Century there was one wizard that I can think of, Germain the Wizard. Perhaps one of these men also played a part in the inspiration of the character! Finally, look at the poster below, it kind of looks like something out of the Wizard of OZ with flying monkeys and munchkins! UPDATE: WildaboutHoudini.com has an article on the Houdini connection to the OZ movie which is excellent as always. Thanks for these sorted facts, I will keep them in mind while watching Oz the Great and Powerful (2013) magician 3d movie.